Harsh V. Pant teaches at King’s College London in the Department of Defence Studies. He is also an Associate with the King’s Centre for Science and Security Studies and an Affiliate with the King's India Institute. His current research is focused on Asia-Pacific security and defence issues. His most recent books include Contemporary Debates in Indian Foreign and Security Policy (Palgrave Macmillan), Indian Foreign Policy in a Unipolar World (Routledge) and The China Syndrome (HarperCollins). China is an emerging superpower with growing economic and political interests worldwide that need to be preserved and enhanced. As China becomes economically powerful, it has also become more ambitious and assertive. Its foreign policy strategy is aimed at protecting the country from external threats as it pursues its geopolitical interests, allowing China to continue with economic reforms as well as the acquisition of comprehensive national power. China initially shied away from playing an active role in international affairs commensurate with its economic weight. This was primarily because the political leadership made a strategic choice to concentrate on economic development at home without attempting a more interventionist global role lest it distract from the number one priority of economic development. But the last few years have seen China shun this reticence like a traditional great power and signal that it is no longer willing to watch international events unfold from the sidelines, thereby promoting its new status as a global player of significance. It is this evolving global profile of China that is the focus of this book as Harsh V. Pant examines the growing role of China in various parts of the world – Asia-Pacific, South Asia, Africa, Middle East, Indian Ocean and Europe – and the tough diplomatic choices that it is having to make as it goes about asserting its interests. China’s global economic clout has already been widely acknowledged. Harsh V. Pant’s China’s Rising Global Profile shifts the analytical lens to China’s increasing engagement in international politics and expansion of its presence as part of the behaviour intrinsic to its status as a world power. 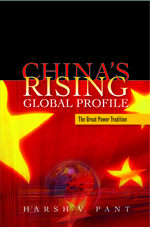 This insightful and well-written account documents and evaluates China’s emerging role as an important powerbroker in the various regions of the world such as the Asia-Pacific, South Asia, the Middle East, Africa, and the European Union. The scope and breadth of this monograph makes it essential reading for all who are interested in mapping and understanding China’s increasingly high profile role in contemporary World politics. By exploring China’s increasing engagement in international politics and the expansion of its presence as a world power, Pant (King’s College London) seeks to evaluate China’s emerging role as an important power broker in various regions of the world. This well-written volume’s seven chapters include an introduction. Chapter 2 examines China’s emerging role in the Asia-Pacific region. Chapters 3 and 4 look into whether India has found a way of asserting its power in South Asia while attempting to contain China’s rapidly increasing influence in the region. Chapter 5 explores China’s policy priorities in the Middle East by analyzing its relations with three key regional players: Iran, Saudi Arabia, and Israel. Chapter 6 discusses China's growing engagement with the African continent. Chapter 7 addresses trends in China's relations with the EU and the implications of recent EU policy initiatives. The author believes "the EU will have to move beyond trade and economics to give this relationship [between China and EU] greater meaning and substance. Otherwise, there is a danger that China’s rise and America’s relative decline might further marginalize Europe in global affairs. Highly recommended.